Ristikontra - thanoscardgamess jimdo page! Ristikontra (named also Ristiklappi) is a Finnish game for four players, which is popular in lumber camps. The name means something like 'counterattack' . Tricks are won by the last card of equal rank to the card led. 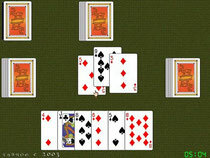 The object is to take tricks containing aces, 10s, kings, queens and jacks. The dealer deals six cards to each player. After playing a card from hand each player must draw the top card from the stock, so that the players always to hold six cards in their hands. The winner of the trick leads to the next trick. When there are still cards in the stock, any time it is a player's turn to lead a card or play to the trick, the player may turn up the top card of the stock and play that. This is known as 'playing in the dark'.